The Best Political Science blogs from thousands of top Political Science blogs in our index using search and social metrics. Data will be refreshed once a week. 2.40 Vox - Understand the news. 2.82 TheNew West | Official blog of the Western Political Science Association. Political Science newsletter is a comprehensive summary of the day's most important blog posts and news articles from the best Political Science websites on the web, and delivered to your email inbox each morning. To subscribe, simply provide us with your email address. Washington, D.C. About Blog A site from the American Political Science Association covering people, research and news in political science. APSA supports political scientists from all fields of inquiry, regions, and occupational endeavors within and outside academe in order to expand awareness and understanding of politics. Facebook fans 21,505. Twitter followers 17,483. About Blog Breaking news and analysis on politics are given here.The mission of this blog is to publicize political science research, to provide informed commentary on political events and issues, and to think aloud. Facebook fans 5,448. Twitter followers 37,573. Ithaca, NY About Blog I teach political science at Cornell, and work on political economy, Islam, Southeast Asia, and methods. I study the interaction of political and economic systems, mostly in emerging market economies. Facebook fans n/a. Twitter followers 6,133. Toronto About Blog Milan Ilnyckyj is conducting research on pipeline resistance in the United States and Canada and writing his PhD dissertation on campus fossil fuel divestment campaigns in Canada. He has done PhD in Political Science at the University of Toronto. Ottawa, Ontario About Blog I am a political scientist, specializing in International Relations. I read alot about American politics and sometimes about Canadian politics. I like to take ideas I once learned a long time ago and apply them to whatever strikes my fancy. Facebook fans n/a. Twitter followers 10,716. Outside the Beltway About Blog Online Journal of Politics and Foreign Affairs. Analysis of US politics, world affairs, and public policy from an educated, thoughtful perspective. Facebook fans 1,654. Twitter followers 804. About Blog The American Journal of Political Science is committed to significant advances in knowledge and understanding of citizenship, governance, and politics, and to the public value of political science research. AJPS is the official journal of the Midwest Political Science Association. Facebook fans 4,005. Twitter followers 6,300. About Blog She writes about politics and insights which includes public interest issues, policy, equality, human rights, social science. About Blog A subreddit to discuss political science. Postings about current events, as long as there is a political science angle. New York, NY About Blog The best political statistical analysis website out there.The site cuts through an avalanche of polling data and economic statistics to tell you what is really happening in the economy and in the political world. Facebook fans 371,275. Twitter followers 889,885. Washington, D.C. About Blog Political news about Congress, the White House, campaigns, lobbyists and issues.POLITICO is a global news and information company at the intersection of politics and policy. Facebook fans 1,681,394. Twitter followers 3,266,795. About Blog This blog provides all the calculations involved in political science. Also how those calculations affect political science. We create easy-to-use, simple tools to do the math related to them so you can get in on the action too! About Blog The Political Quarterly has explored and debated the key issues of the day. It is dedicated to political and social reform and has long acted as a conduit between policy-makers, commentators and academics. Facebook fans 36,236. Twitter followers 332. About Blog This subreddit is intended for comparative political scientists to post and discuss research or anything else related to the study of comparative politics. About Blog Policy Studies Journal is best characterized as an outlet for theoretically and empirically grounded research on policy process and policy analysis. Facebook fans 36,238. Twitter followers 332. London About Blog Team of bloggers write about the politics of science and technology on guardian. Facebook fans 7,595,062. Twitter followers 6,644,402. New Delhi, India About Blog Find out the views, opinions, analysis of our experts on politics. Facebook fans 29,308. Twitter followers 9,395. About Blog Wiley Online Library hosts the world's broadest and deepest multidisciplinary collection of online resources covering life, health and political science and the humanities. About Blog Political Behavior publishes original research in the general fields of political behavior, institutions, processes, and policies. Coverage focuses on conventional and unconventional political behavior of individuals, and of large organizations that participate in the political process such as parties, interest groups, political action committees, governmental agencies. Facebook fans 2,916. Twitter followers 1,298. About Blog Political Psychology is dedicated to the analysis of the interrelationships between psychological and political processes. International contributors draw on a diverse range of sources, including cognitive psychology, economics, history, international relations, philosophy, political science, political theory, sociology. About Blog Read the latest headlines, news stories, and opinion from Politics and more. Facebook fans 9,633,277. Twitter followers n/a. About Blog Governance provides a forum for the theoretical and practical discussion of executive politics, public policy, administration, and the organization of the state. It emphasizes peer-reviewed articles that take an international or comparative approach to public policy and administration. Massachusetts About Blog MIT News is dedicated to communicating to the media and the public the news and achievements of the students, faculty, staff and the greater MIT community. Facebook fans 1,001,388. Twitter followers 8,512. About Blog Providing researchers on international politics with access to millions of scientific documents from journals, books, series, protocols and reference works. About Blog The Journal of Political Philosophy is an international journal devoted to the study of theoretical issues arising out of moral, legal and political life. It welcomes, and hopes to foster, work cutting across a variety of disciplinary concerns, among them philosophy, sociology, history, economics and political science. About Blog East European Politics is a refereed journal which publishes articles in the government, politics and international relations of the post-communist space.The journal publishes original scholarship on political developments in individual countries, together with cross-country comparative analyses and studies of the relations between post-communist regions and other parts of the world. Facebook fans 7,906. Twitter followers 5,036. About Blog Asian Journal of Political Science publishes in major areas of political science, including comparative politics, political thought, international relations, public policy, and public administration, with specific reference to Asian regions and countries. Facebook fans 7,933. Twitter followers 5,057. Minneapolis, MN About Blog Smart Politics is a non-partisan political news site.Smart Politics publishes original, data-driven reporting and analysis of public policy, campaigns, and elections for Minnesota, Upper Midwestern, and national politics. About Blog Environmental Politics is attentive to the diverse ways in which 'the environment' is and has been understood, and to the range of social and political strategies pursued in its name. Washington, DC About Blog Governance for Development informs and stimulates debate on how governments can help end poverty and boost shared prosperity. Facebook fans 2,325,509. Twitter followers 2,429,055. United Kingdom About Blog The Journal of European Public Policy (JEPP) has established itself as one of the flagship journals in the study of public policy and European politics. Facebook fans 7,933. Twitter followers 5,841. About Blog The Journal of Theoretical Politics is an international peer reviewed journal one of whose principal aims is to foster the development of theory in the study of political processes. Facebook fans 3,797. Twitter followers 4,864. United Kingdom About Blog Table of Contents for Journal of Women, Politics & Policy. List of articles from both the latest and ahead of print issues. Paris About Blog The mission of the Organisation for Economic Co-operation and Development (OECD) is to promote policies that will improve the economic and social well-being of people around the world. Facebook fans 220,752. Twitter followers 504,434. United Kingdom About Blog Mediterranean Politics is a refereed journal which brings together research on the contemporary politics and international relations of the Mediterranean and the regions surrrounding it. Rockville, MD About Blog Scientific viewpoint on politics. Read summaries of recent research on political parties, policies and projections. Facebook fans 1,760,617. Twitter followers 211,225. United Kingdom About Blog Political Communication is an international journal which welcomes all research methods and analytical viewpoints that advance understanding of the practices, processes, content, effects, and policy implications of political communication. London About Blog Experts analyse and debate recent developments across UK government, politics and policy. Our central aim is to increase the public understanding of British politics and policy by providing accessible academic commentary and research. Facebook fans 365,796. Twitter followers 39,910. 40. Vox - Understand the news. About Blog Vox describes its mission as "explaining the news." The website focuses on public policy and economics but also includes articles on science. Facebook fans 1,975,867. Twitter followers 678,221. About Blog Political Studies Review (PSR) provides unrivalled review coverage of new books and literature on political science and international relations. Facebook fans 3,798. Twitter followers 4,872. Ann Arbor, MI About Blog CPS is a non-partisan research center which helps provide information to enhance political knowledge. Facebook fans n/a. Twitter followers 11,323. About Blog This major journal provides a forum for the analysis of political parties, including their historical development, structure, policy programmes, ideology, electoral and campaign strategies, and their role within the various national and international political systems of which they are a part. About Blog Research & Politics aims to advance systematic peer-reviewed research in political science and related fields through the open access publication of the very best cutting-edge research and policy analysis. Washington, DC About Blog Analysis and insight into talked about and trending markets. A one-stop resource for press, researchers, traders, and the curious. Facebook fans 21,047. Twitter followers 13,433. About Blog The Journal is particularly interested in addressing the political, economic, social, military and strategic aspects of global health issues. Facebook fans 179. Twitter followers 3,511. About Blog Marginal Revolution is a website which offers information and latest updates on the topic political science.Site is a platform to share different ideas and views regarding social science. Facebook fans n/a. Twitter followers 38,455. About Blog Table of Contents for Global Environmental Politics. List of articles from both the latest issues. Facebook fans 111,478. Twitter followers 48,149. About Blog Lawyers, Guns and Money is a politics and culture blog with an academic focus. Facebook fans 3,770. Twitter followers 3,149. Alliance, Ohio About Blog The University of Mount Union's mission is to prepare students for fulfilling lives, meaningful work , responsible citizenship and update them with topics such as political science. Facebook fans 10,189. Twitter followers 5,680. Willimantic, Connecticut About Blog This social media site is maintained by Eastern Connecticut State University which provides content related to political science, philosophy and geography. Facebook fans 15,603. Twitter followers 3,088. Loudonville, New York About Blog Students provide original content and insight into modern politics, from a variety of backgrounds and subfields – including American political institutions and elections, public policy, political theory, gender politics, pop culture and politics, public law, international relations, human rights, foreign policy, and more! Facebook fans 29,719. Twitter followers 44. About Blog Politics and sometimes culture from a rude liberal in blog form. Facebook fans 15,215. Twitter followers n/a. London, UK About Blog Founded in 1950, The Political Studies Association (PSA) exists to develop and promote the global study of politics. Facebook fans 3,581. Twitter followers 10,195. New York, NY About Blog Political Science Quarterly has been the most widely read and accessible scholarly journal on government, politics, and public policy. Facebook fans 16,817. Twitter followers 409. Hanover, NH About Blog Brendan Nyhan is a Professor in the Department of Government at Dartmouth College. His research focuses on Political Analysis, Political Behavior, Political Psychology and Social Networks. Facebook fans n/a. Twitter followers 55,269. Germany, UK, Greece: Europe About Blog Professor of Politics at uni_mainz who discusses about parties, elections, attitudes, behaviour , right-wing extremism, populism and radicalism in his blog. Facebook fans 196. Twitter followers 2,482. About Blog Explorations of Empirical and Formal Research in Political Science.The goal is to discuss, elaborate, critique, and announce current and emerging research in the subfields that is relevant to the study of international relations and comparative politics. Facebook fans 123. Twitter followers 570. Brighton About Blog Analysis of the contemporary Polish political scene. About Blog Josh Putnam is a political scientist who specializes in campaigns and elections.Frontloading HQ covers national politics focusing mainly on presidential elections and the rules governing the Democratic and Republican nomination processes. Facebook fans 532. Twitter followers 6,039. About Blog I'm Professor of Political Communication in the Centre for Research in Communication and Culture. About Blog A blog about international political economy, international development, international business, international politics and international economics. Coast of Morocco About Blog Political commentary with scholarly references, misanthropy, obscure references and pretentious music. About Blog This blog talks about dilettante's journey how he entered into the field of political science who found that idea of studying politics meant studying about government. Co. Galway and Roscommon, Ire About Blog I'm interested in international relations, American foreign policy, climate change, US presidential elections, public debate, Kansas Jayhawks basketball, film, and major league baseball. Facebook fans n/a. Twitter followers 2,322. About Blog This site provides detail about what we research, what we think about political affairs, what is new in the department, and what we love about teaching.This site is maintained and operated by the faculty of Villanova University’s Department of Political Science. About Blog Research and analysis of the global political-economic reality versus the mainstream myths. Facebook fans n/a. Twitter followers 6,071. About Blog Keep up with the world’s ever-changing borders. New countries, disputed territories, breakaway states, rebel-control zones and more. Visit our website for quality maps and concise articles! Facebook fans 3,208. Twitter followers 840,269. BCN About Blog Josep Colomer use this blog to interact with colleagues, former students and other people interested in the science of politics.He is a Research Professor in Political Economy. New York About Blog Her research concentrates on the links between the mass media, public opinion, and decision-making and on domestic and international terrorism and counterterrorism. B. Nacos received a Ph.D. in political science from Columbia University. Sydney, New South Wales About Blog Sydney Health Law provides information on the latest developments and events in health law, ethics, and governance, focusing both nationally and globally. Follow this site to know more about topics including the ethical dilemmas of biobanks, developments in chronic disease prevention, and the issues posed by refusal of consent to medical treatment and much more. Facebook fans n/a. Twitter followers 1,012. About Blog A blog dedicated to all things Political. Anyone and everyone is more than welcomed to come and chat about their views on any of these political issues of the international world. About Blog This blog reflects political perspectives, analysis articles due to following PhD studies in International Relations. Currently I am a PhD student at Epoka University and my interested fields are on democracy, human rights, constructiveness and citizenship. Boston, USA About Blog This blog provides news about Governance: An International Journal of Policy, Administration and Institutions. Governance is published by Wiley-Blackwell. About Blog Dedicated to Unlimited Debate about American Politics.Our primary aim is to analyze political events through the lens of political science. Maynooth, Ireland About Blog This is a blog hosted by staff and students at Maynooth University’s Department of Geography.This blog has posts covering the full range of what we take to mean by political geography. Facebook fans 130. Twitter followers 1,019. The Netherlands About Blog Jessica Duncan is Assistant Professor in Rural Sociology at Wageningen University.Her research areas include: food policy; food security; global governance; environmental policy; and participation.Her main research focus concerns the practices and politics of participation in food policy processes. 82. TheNew West | Official blog of the Western Political Science Association. the new west About Blog Western Political Science Association is an association of more than 1350 political scientists. Blog will feature both scholarly commentary on current events as well as pieces about new and recently published scholarship. Facebook fans n/a. Twitter followers 2,259. Bozeman, MT About Blog Created and maintained by professors of political science at Montana State University, this website seeks to bring political science analysis to current political events in Montana, the United States, and across the globe. Our aim is to provide nonpartisan analysis and commentary in a political world replete with punditry and partisanship. Facebook fans 33. Twitter followers 1,289. About Blog I am a Ph.D. candidate in Political Science (political theory) and Women’s Studies.My interests include modern and contemporary political theory, emotion and affect, feminist theory, queer theory, and neoliberalism. Washington, DC About Blog Brendan is a scholar and practitioner interested in politics, particularly as it relates to the fields of democratic governance and international development. I believe that these three areas – politics, governance and development – are inherently linked, and that politics is at the heart governance and development challenges. This blog is a place to explore these ideas and their interplay. About Blog Kevin is a Tibetologist and political scientist. Subscribe us to get updates about the Tibet issue from Kevin Kieswetter. About Blog An International Political Analysis Initiative. 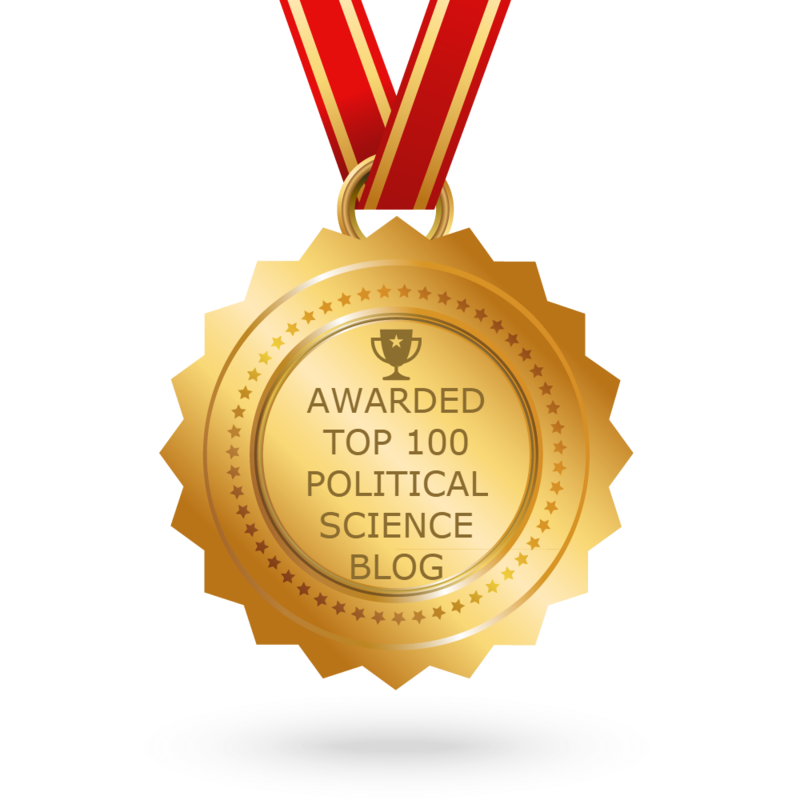 CONGRATULATIONS to every blogger that has made this Top Political Science Blogs list! This is the most comprehensive list of best Political Science blogs on the internet and I’m honoured to have you as part of this! I personally give you a high-five and want to thank you for your contribution to this world.